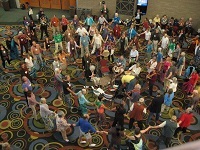 These are complete recordings of live Dances of Universal Peace, available as downloads via links in our Members Newsletter, as well as here at our website. We are archiving all of these recordings so that you can download at any time and add to your collection. (Browsers handle downloading differently.) You can also play these songs on your tablet or play and download these songs with your Android phone. 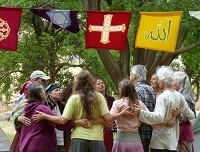 Each of the Dances of Universal Peace is a spiritual teaching. 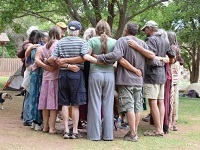 Every time we gather together and join our voices and hearts, we strengthen that vibration in ourselves and in the universe. 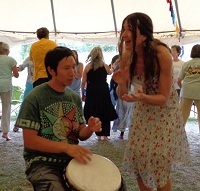 How often have you left a retreat or Dance circle wanting to sing a song and only a fragment of it is remaining? Having recordings of songs allows us to take these songs into our daily life, into our practice, and to hold them deeply in our heart. Sharing them with fellow dancers and musicians allows them to spread far and wide. In the coming months you will likely discover new gems and become reacquainted with old favorites. 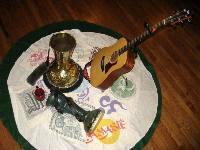 En Lak’ Ech originated by Hafiz Heartsun, melody by Jonathon Goldman. Traditional Mayan Greeting & Hunbatz Men, Mayan Daykeeper. This traditional Mayan greeting means “I am another you, You are another me.” The mirroring movements offer an opportunity to bring awareness and sensitivity to the way in which we meet another, and our response to that. This beautiful dance, created by Arienne and Wali van der Zwan, is based on the healing prayer ~ Nayaz ~ from Hazrat Inayat Khan. In 2014 during a Dance Tour of Lake Atitlan in Guatemala I first heard the words “Madre Lago” from Juan Manuel, a teacher of environmental programs for children in San Pedro, one of the villages bordering the lake. The words mean “Mother Lake” in Spanish and it is how the teachers of the Taa’pit children’s environmental education program teach the children to think of the lake. The lake is formed from a volcanic crater and is ringed by 3 volcanoes. It is one of the most breathtakingly beautiful spots on the planet. It is also endangered, and the idea of Taa’pit is that if we can teach the children to honor the lake as mother, future generations will do a better job of maintaining its waters and preventing the sino bacteria blooms resulting from pollution that threaten the lake periodically. So this song and dance is meant to help them with their effort to inspire environmental consciousness in their communities. The words are all either Spanish (the second language for most of the indigenous Mayan people who live there) or Tzu’tzuhil, one of the twenty plus Mayan dialects spoken in the region and in that part of the Lake. Atit’ala is Tzu’tzuhil for “spirit of the lake”. In the indigenous Mayan spiritual traditions every being has an essence called a Nahual. It came to me that the nahual of this lake had to do with its volcanic origins, so is infused with the elements of fire and water. The remainder of the words in Spanish are “Por La Vida, y La Comida, y tu Espirtu que nos quida” which means “for life and sustenance (food) and your spirit that cares for us”. Then the last line is Gracias, Bendicirnos, “thank you, bless us”; followed by Maltiox (pronounced Maltiosh) Ahao. These words are from the Tzutzuhil. Maltiox (pronounced “maltiosh”) means thank you. 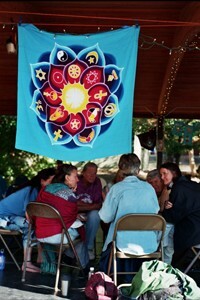 Ahao refers to the Spirit, both above and below and all around us. With My Feet Upon The Earth, originated by Michael Sheehan. The words of this Dance are featured in our holiday card. 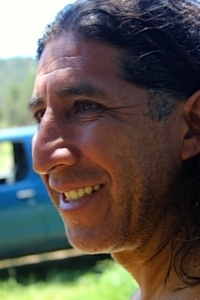 Michael shares, "On the shore of Flathead Lake in Montana, a Native American spirit named Chief Brown Wolf appeared to me and gave me this dance. It brings awareness to our connection with the four elements: water, air, earth and fire (sunlight). Also inferred is the fifth element, ether, as the quiet." The Kalama is one of the original Dances of Murshid SAM and perhaps the most widely known of all the Dances. It is frequently used to seal the end of an event. 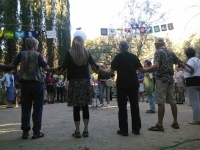 Led here by Zareen Connie Delaney, closing a week of Wilderness Dance Camp. Our December song, Like the Trace of a Bird, originated by Anahata Iradah, was the inspiration for our holiday card. The words in the song were used by Vajra Master Padma Sambhava to describe the fruits of his mediation practice. Grandmother Ocean led by Grace Marie. Words and Music: Alicia Merlady Bennett, used with permission, movements by Gwindolyn Samia Lehman and Grace Marie. Grace Marie shares: "In the Dance...the melody, words and movements evoke the feeling of a lineage, the affirmation and connection to the ocean, the waves symbolizing cycles. One can feel the waves, the ebbs and the flows within, to accept and flow with the cycles of life that dwell within. 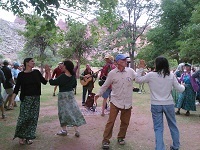 In October 2001, I organized a women’s Dance of Universal Peace and invited a dance leader from Hawaii who had moved to the northern Colorado local area, Gwindolyn Samia Lehman, to lead Grandmother Ocean. We have been dancing it ever since, evolving and flowing with it, understanding its message better each time. The words originally ended as “in the shadow of my being”. In time, Dancers, suggested additionally using other words, such as, “seasons” and “essence” to reflect other aspects of inner beingness. It is a fluid dance, as water is fluid as seeks the path of least resistance. Swim and flow in its beautiful waters." Chidananda Rupa originated by Narayan Waldman: I Am eternal bliss...I Am Shiva. Inspired by a bhajan from guru Siddharameshwar Maharaj (Nisargadatta Maharaj's guru) of the Inchagiri Sampradaya lineage. The words affirm our Infinite Reality, in contrast to our typical human illusory attachments to the body, to the mind, to emotions. Pieces of Cloud, originated by Susan Nechama Sheely and Oraea Varis is led here by Andriette Pierone. This Dance was inspired by the words of a Rumi poem. Nembutsu Dance, one of the original Murshid SAM Dances led by Wali Ali Meyer. 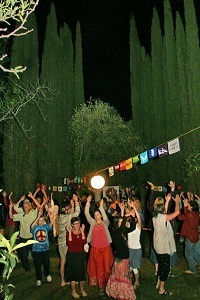 This Dance is a practice of deep attunement to the Amida Buddha: the Buddha of infinite light, wisdom, and compassion. The Amida Buddha is the fourth of the Dhyani Buddhas, personifying light. Zikr of Surrender by Shivadam, who writes: "Our aspiration and intention to always move forward on the path may sometimes meet with a sense that we are moving backwards. When such feelings arise, we remember ar-Rahim and surrender to the circumstance with compassion for ourselves; we step back into the embrace of that Divine Mercy which envelops all, without boundary, exception, or limitation. As the One is everywhere, there can be no step in any direction that is not toward the One." Medicine Buddha "This dance has an interesting story as it has been a long concentration practice over many years and the dance took many years to finally come through. Initially in 1987 a Tibetan monk gave me a copy of the Medicine Buddha Sutra, the Sutra on the Merits of the Fundamental vows of the Master of Healing, the Lapis Lazuli Radiance Tathagatha which I studied. Not too long after this I was initiated into Medicine Buddha practices by two Tibetan Lama’s. In the 1990s I recorded the Dharani in Sanskrit given in the Sutra and put this out on cassette. This is available now for free download on my website. The shorter Tibetan form of the mantra given in the Medicine Buddha puja became a regular mantra for practice and healing and I began the concentration on a dance. The melody took at least 10 years to come through and the dance several years after that." Peaceful Steps originated by Leilah Be. The inspiration of this Dance came from listening to a teaching from Thich Nhat Hanh. Here is a paraphrase of the teaching. "When walking from the dining hall to the meditation hall, walk with mindfulness. With each mindful step, you wish to be a peaceful influence on the earth, to have compassionate thoughts towards all beings. As you step, a flower blooms in each place your foot has touched. When you meet people along the way, what do you have to offer them? Your smile is like offering them a flower, your presence is like a flower and also you see before you a person who is like a beautiful flower. Your present moment awareness is like a fragrance. You always have something to give, you are never without a gift." 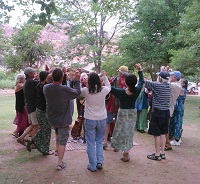 We are the Rising Sun, a circular (pun intended) chant recorded at a pre-Dance moment at the Canyonlands Camp, led by Bernie Heideman. From Psalm 46, line 10 (line 11 in the Hebrew Old Testament). It is called the 0th Commandment because how can anybody listen to anything until one can really hear, and that requires really letting what Is, Be? Which is what the very first word, äøôå, in this commandment says; Be still; Desist; Let go. The Sufi says, "Die before death. "; Buddha (paraphrasing) "Death is too important to wait until you are dying"; St. Francis, "For it's in dying that we are born to eternal life", and so on and on and on. You get a great chance with every repetition of this song, even every breath...give it a whirl. Better yet, let It give you a whirl. 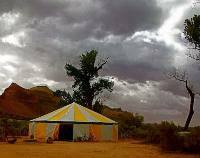 Ya Quddus Ya Jami’ led by originator Maboud Charles Swierkosz at Hummingbird Camp in NM. With Ya Quddus “we take leave of habitual patterns in order to experience the true essence of life and the ecstasy of our pure soul. We let go/transcend lower self to keep moving toward the One and the purification of our existence.” (Physicians of the Heart) This separating out process can be seen in the cycle of nature where plant life has a season of dying, letting go of its seeds, its fruits, its leaves. The energy returns to the earth, their source and roots only to arise in the Spring with renewed life force. Ya Jami’(ah) “affirms our intention to bring all parts of ourselves into a whole, to return to the real self and reconnecting to our wholeness and the divine.” (Physicians of the Heart) We harvest the fruits of our devotion and practices and realize a sense of joy from this. Prayer Wheels - Movements: Covita Moroney and Darvesha Victoria MacDonald. Led by Darvesha, who shared, "Lama Tashi, who was head chant master at Drepung Loseling monastery, heard this melody in his village as a boy. He says that as a boy he got thrill bumps when he would hear his whole village singing this melody together on special holidays. Then, to his great surprise, when he traveled to join the monastery, he found the very same melody." 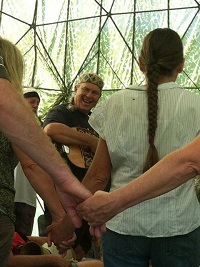 Workingman's Zikr originated by Vayu Brian Jameson, led here by Sky Majida Roshay. Vayu shares, "I created it one night while working night shift as a custodian at the County Courthouse. I'd take a break from cleaning every once in awhile and work on the zikr. By the end of the shift, the Workingman's Zikr was ready to go." 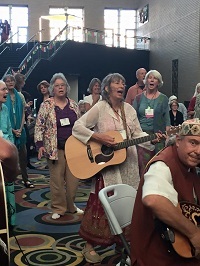 Jan. SOM: Take Me as I Am Zikr, originated by Zareen Connie Delaney, who shares: "This zikr uses the same chords as Take Me As I Am, a hymn from the Iona community that was put into a Dance by Talia Marcus. It occurred to me, while leading that Dance, that the zikr phrase, 'La illaha il allah,' which can be translated as 'There is no reality by the one true reality,' is like God or Allah or Existence standing before us humans asking us to stop creating concepts around how we think reality should be, creating victims of ourselves, and refusing to acknowledge the one true reality. Like the Universe itself is asking us to 'take Me as I am.' And 'estafferallah,' adding 'Make me pure enough to see it'." Feb. SOM: Freely Give, Freely Receive, originated by Allaudin Ottinger, inspired by the May 21 Bowl of Saki. Our Song of the Month for December is Surya Ram originated by Mirabai Wolf Willow. The Dance is a celebration of the sun energy of Lord Rama, who is said to have been endowed with dazzling transcendental qualities, haloed as if by the rays of the sun. As we dance this invocation of Lord Rama and his many wonderful qualities of strength, steadfastness to purpose, morality, love and devotion, we evoke these qualities in ourselves and allow our own luminous beings to be seen. Into Your Hands by Munir Peter Reynolds. These last words of Jesus are often said or sung in the Catholic office of Compline, the last service of the day before the night watch. Like all of the offices of the day, Compline is imbued with its own energy, in this case a time for prayers, contemplation and purification before entering into the world of sleep. As the offices of the day symbolically represent the journey of a lifetime, Compline corresponds to the end of life. September's SOM is Steady on the Path by Maitreya Jon Stevens. This Dance calls on the power of al-Qadir, al-Muqtadir, and al-Matin to keep us moving steadily on the path of our divine purpose. Our Song of the Month for May honors the Holy Mother, Our Lady of Guadalupe. Listen to a variation of Altisimo Corazón led by Narayan Waldman at the Crossing the Veil retreat in Ohio, 2010. 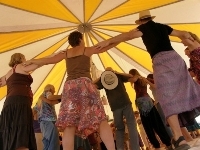 Altisimo Corazón is a devotional dance about the flourishing of the light of the "Divine Heart," the Altisimo or Highest Heart, within the entire creation and within each of us. It was inspired by the pilgrims at the Basilica of Our Lady of Guadalupe who walk into the Basilica on their knees with intense devotion. The song is a traditional one from the Aztec people. It refers to Quetzalcoatl who has had many manifestations both as a God and as a King since 1200 B.C. When portrayed as the feathered serpent, Quetzalcoatl represents the blending of heaven and earth. Quetzalcoatl has been called the god of the breath of life, the god of rebirth. He is associated with the planet Venus, the brightest star in the evening sky. This traditional song is often the last song sung before sunrise on the Festival of Our Lady of Guadalupe (hwa da LOO pay), December 12. At the Sacred Heart Church in San Jose, California, after a night of dancing, singing and chanting, the congregation sings this song as the children throw petals from the altar flowers over the Aztec dancers during their recessional into the light of the new morning. For many years, it was sung at the Festival of Our Lady of Guadalupe at her Basilica below the Hill of Tepeyac, just outside Mexico City. This is also the home of the Aztec Mother Goddess, Tonatzín. "Altisimo Corazón" has a dual usage with both Aztecs and Christians. For some of the indigenous people it is Tonatzín, and for Catholics it is Mary the mother of God who lives on through Our Lady of Guadalupe. For others, this song is sung in celebration of the banning of human sacrifice of the heart to the gods by Quetzalcoatl. This dance uses mudras of Tonatzín and Mary as they offer grace and comfort to all who come to them and as they shine light through their hands down to the earth. The touch-brush step is used by Aztec dancers in California. There Is Love, by Shivadam Adam Burke, is the Song of the Month for March. Recorded in the historic Groom Creek Schoolhouse in Prescott during a Dance Leader Training with Darvesha, Yaqin and others, this Dance was inspired by Mathew 18:20, along with some Peter, Paul and Mary. Here, "Thy Name" is any name of the One Beloved. Our first Song of the Month for 2012 is the Tara Zikr by Darvesha. 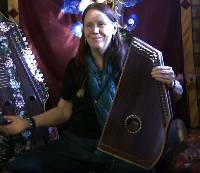 This recording was made at the Prescott Dance Leader Training in March 2011 and features Parvati Burke calling out the attributes of Tara. Om Tare! In The Cave Of My Heart - This song from the Mary Magdalene cycle of dances seems to me to resonate with this season of the birth of love and light midst the darkness of the Winter Solstice. According to one modern Magdalene teacher, “Mary is finally rising from the hidden caves of our unconscious.” Caves have long been a symbol that leads us deep into the mysteries of the divine feminine. In one of the legends of Mary Magdalene, she is believed to have spent the last years of her life in the Cave of St. Baume in or near Provence, France, where she lived, taught, and meditated until her death. During meditation, the mystical meaning of the cave as the dark womb of creation arose through this song, bringing together the many threads of symbolism in the love story of Yeshua and Maryam. One could imagine her singing a prayer to her Beloved from deep within the cave of her heart. ~ Amina Linda McMakin December 2, 2011. Visit www.magdalamatrix.com for more Mary Magdalene Dances. "A hide is soaked in tanning liquor and becomes leather. Our Song of the Month for September, Vilca Yaku Mama, features one of our next-generation Dance leaders, Arjun Calero, from Columbia. Several camps this summer welcomed our brothers and sister from Columbia and we honor their friendship and gifts. 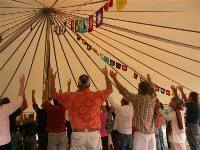 This Dance was recorded at Flathead Lake, MT, at Wilderness Camp. This Dance came into existence after Arjun finished singing a praise chant to a lake. As a response, melody, words and movements arrived in the following moments, almost as a transmission from the water itself. There is great reverence for water in the teachings of the descendants of the Inca people. The words for this dance come from three different types of Quechua language spoken by descendants in Peru, Ecuador, and the Amazon. It is a dance that honors the sacredness of water, including its unique and essential qualities that make life possible in this creation. It is a dance that is felt in the heart – a love song to the sacred water. 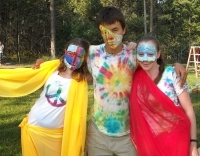 July's Song of the month is Abwoon to the 4 Directions, led by Hannah Liechty, age 13.It was recorded in Ithaca, June 2011 Hannah has been attending Ithaca Dance Camp since before she was born. 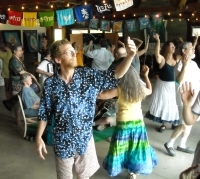 Hannah first experienced this Dance at a retreat led by Munir Reynolds, which she was attending with her parents, Naomi Wilansky and Dan Liechy. All three of them felt a connection to the Dance, and several months later encountered it again, and learned that the originator was Ayesha Lauenborg, Naomi's first Dance mentor. The Dance came through her when she visited Ground Zero and was walking around the perimeter, praying; thus the Shemayas to the four directions. The family was deeply impressed by the way the Dance came into their lives and has been leading it ever since. 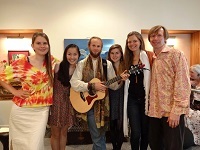 Our Song of the Month for June is Healing Time, led by Bernie Heideman, melody by Kate Poole. 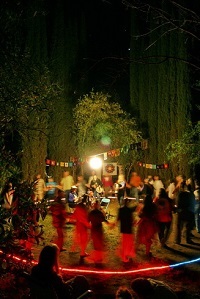 Enjoy it as you celebrate the summer Solstice and the Dance camp season swings into full gear. 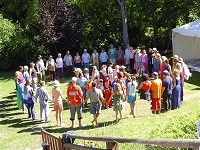 Recorded by Rahmana at Wilderness Camp 2010. The Song of the Month for May is What's Next by Maitreya Jon Stevens, one of our next-generation of Dance leaders. This month's feature is Rabia's Song by Wali van der Zwan and Zuleicha. 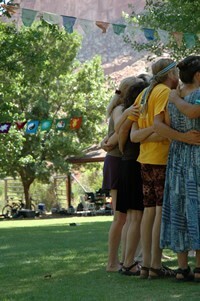 This version was led by Zareen Connie Delaney at Lava Hot Springs in April, 2010. You can also hear the voice of Wayne Talmadge accompanying her. Celebrate the last days of winter with our Song of the Month, Be Melting Snow by Lila Flood, inspired by the Rumi poem of the same title. 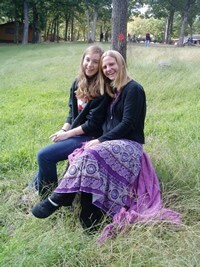 Led here by Farrunnissa and recorded at Wali Ali's retreat in Charlottesville, VA 2010. 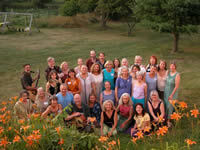 Our Song of the Month for January is the Gayatri Mantra, led by Bernie Heideman at Wilderness Camp 2010. Sing this most powerful mantra and call upon the beings of light from all planes of existence to bring the Divine Light of illumination to our consciousness. For more of Bernie's music, see www.bernieheideman.com. Allah Ho Akbar, by Munir Reynolds, is November's Song of the Month. 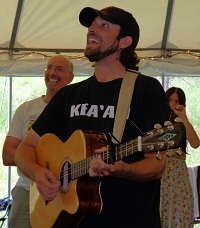 This version, led by Munir, was recorded at Wilderness Camp 2010. Sing this song from your hara center, with your mouth wide open, and feel the power of Allah moving through your body. 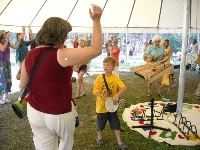 No Part Left Out by Kathleen Hannan, here led by Darvesha at Wilderness Camp 2010, is our offering for September, 2010. Download and enjoy this beautiful song of deep insight and wholeness and read the story behind the Dance. Amen Alleluia Enjoy our August, 2010, offering, this song of praise and celebration created and led by Narayan Eric Waldman. 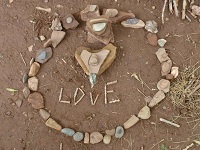 Recorded at Wilderness Camp 2009 by Rahmana Elizabeth Sayre. If you have a Dance recording you would like to feature, contact Jane Sky. In order for any recording to appear as a "Song of the Month," it must have the approval of the Dance's originator and leader. We will be happy to verify that before posting to our site. If you find this resource helpful, please make a donation to DUPNA. Click here to contribute.